The USDA issued a report on August 6, 2016. 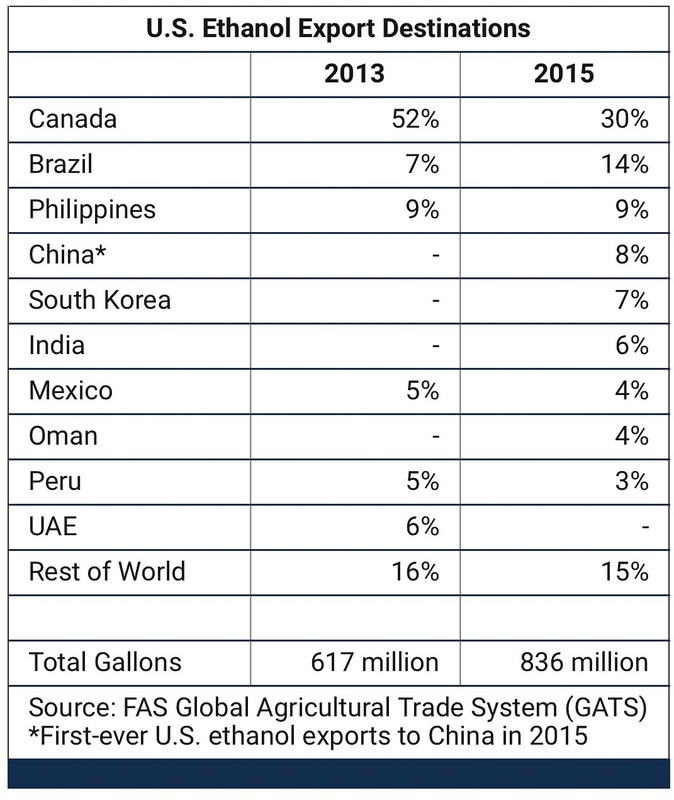 The United States exported 836 million gallons of non-beverage ethanol in 2015, nearly all of which was used for fuel. This volume was unchanged from the previous year and remained the second highest volume on record. 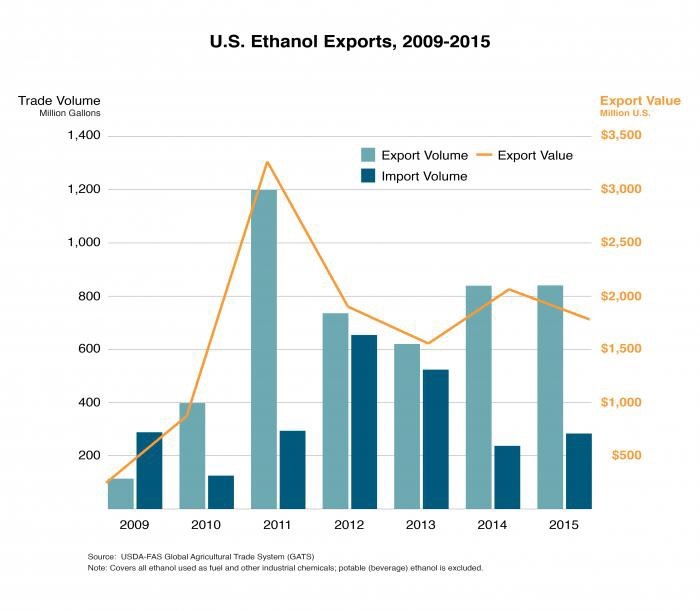 Despite a two-year decline in U.S. ethanol exports following the record 1.2 billion gallons in 2011, overall exports have trended upward since 2009. These three overseas markets were instrumental to diversifying the U.S. ethanol export market in 2015. China: U.S. ethanol exports to China increased 20-fold in one year to a record 71 million gallons in 2015. Previously, U.S. ethanol exports to China were small and excluded fuel. China’s ethanol imports surged in 2015 because imported ethanol was cheaper than domestic supplies and importers were allowed to test the international market for imports. China primarily uses corn to produce fuel ethanol, and following Brazil and the EU, China is the fourth-largest fuel ethanol market with use mandates in six provinces and 27 cities. China’s price support scheme for corn, originally established to safeguard farmer incomes and ensure food security, has resulted in internal prices for corn far above world prices. High feedstock costs inflate domestic ethanol prices and make imports more attractive. Korea: U.S. ethanol exports to Korea increased 55 million gallons over two years to a record 60 million gallons in 2015. More than 90 percent of these shipments were intended for fuel use, which is a change from previous years when more non-fuel, industrial ethanol was shipped. Korea has not yet set an ethanol mandate, but there is interest to do so given its high dependency on crude oil imports and interest to reduce emissions. A roadmap has been set by the Ministry of Environment to begin distributing E3 and E10 in selected cities this year and E10 nationwide by 2035. India: U.S. ethanol exports to India increased 26 million gallons over two years to a record 47 million gallons in 2015. These imports are reportedly used in the industrial chemicals market, thus freeing up domestic supply for fuel use. India fuel ethanol use-mandates are repeatedly missed due to unsupportive regulatory and taxation policies as well as periodic weather-related shortfalls in feedstock (sugarcane) supply.